Now comes the real challenge to get the honey extracted and strained. Anyone trying to extract Heather or Manuka Honey knows what I'm talking about. 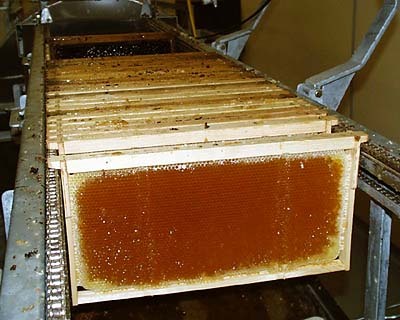 The honey quickly turns into a jelly like state and needs special tools to get out of the combs. The deboxer is lifting frames out of the box, and the frames are pushed onto the chain infeed system and taken one by one by the uncapper. The vibrating heated knives cuts wax when the frames are going through uncapper. 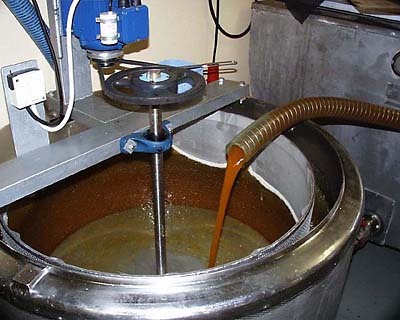 The mix of wax-honey is pumped to a spinner where it's separated and honey runs back to the sump. And the frames comes out clean and straight to the loading rack where the chains take them to the extractor. The Sjoelis Honey loosener. The only efficient tool to get Heather and Manuka Honey out of the combs. 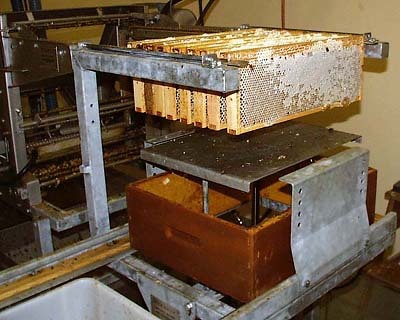 It consists of two plates with small plastic needles that are pushed into the cells and stir the honey so it loosens up and can be forced out during the extracting process. 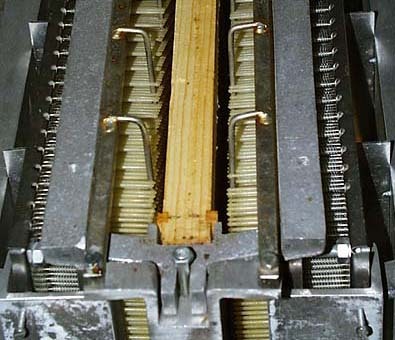 The frame hangs between the two plates with needles, and the machine is operated with a handle that push the plates together and needles are forced into the cells. Five times for each frame they are pushed in, each time the frame is moved slightly (one mm) so the needles work all honey in the cells. Close up of the plastic needles. 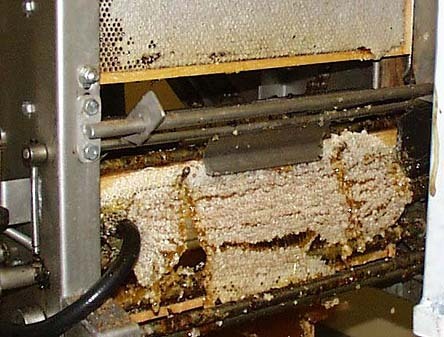 There are 1.700 of them, one for every cell in the comb. Each one is supported by a spring so it will not brake when there is pollen in the cell. The cappings spinner is used to strain the Heather Honey. The flash "freezes" the photo so it looks like the drum is not turning. 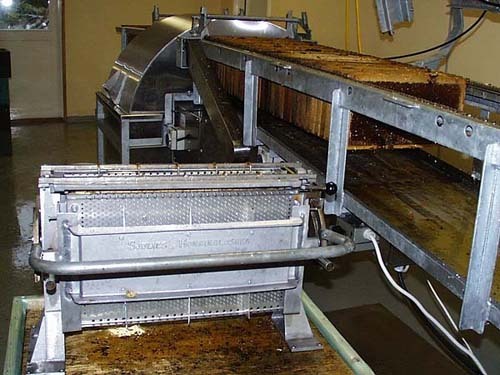 A strainer cloth is put inside the spinner basket and all Honey is pumped through it. 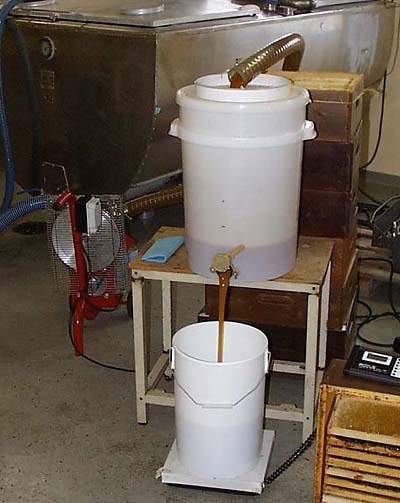 Normally I use a clearifying tank, and leave the Honey in it for a day or two until the wax has floated up to the surface. Then it is easy to pump the Honey out from the bottom and it will run like water through the strainer. But with this gelatinous stuff it's different. No matter how much you heat it, the wax will not float up or the honey get any thinner. The only thing that will help is to stir the Honey. Then it will get liquid, but only for a short time until it goes back to "jelly" again. The pump did that work for me when I pumped the Honey from the sump to the tank. Now this is not something I would recommend to do. 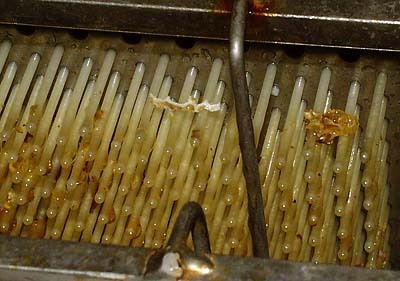 The strainer cloth gets clogged with wax very soon, and has to be taken out and cleaned. But I had nothing better to use at the moment. Some wax particles went through the spinner when I was cleaning the mesh. So to be sure to get all of it I pumped the Honey through another strainer before packing it to buckets for sale. I learned a few things from this experiment. First, I need a better way to strain the Honey, and I would consider using a separator if I was to produce any larger amounts of Heather. Secondly, I killed the old myth that you can't extract thixotropic Honeys with a radial extractor. I know now that a radial extractor works as well as a tangential extractor.